Successfully Added IP Camera with Sony Super HAD CCD (Alarm and Motion Detection) to your Shopping Cart. This IP camera comes in a high grade waterproof die-cast aluminum casing, has 540 TVL of resolution, and a 1/3 inch Sony Super HAD CCD lens for the highest quality video possible from a security camera. What makes it even better is being able to connect it to an ethernet cable for viewing of live footage from anywhere in the world using an IP address. The amazing Sony Super HAD CCD lens on this security camera provides much better sensitivity and a large improvement in smear rejection ratio compared to the conventional CCD camera. Throw in a professional-grade housing and this unit is perfect for use anywhere and at anytime, night or day, light or dark, foggy or clear. When indoors, the clear 540TVL and 720 x 576 resolution will allow you to view detailed and high quality footage. When outdoors, the wide viewing angle and a large viewing range is sure to keep everything within sight. At night, this unit will automatically turn on its 24 infrared lights to provide excellent night vision. Finally, the die-cast aluminum body means you have a weatherproof housing so you can be assured that no matter whether nature gives you sunshine, rain or snow, this camera will always be giving you 100% performance. ATM, Bank cashier, Supermarket, Factory workspace, etc. If you're worried about security but unable to constantly be physically present, then this IP camera should be a great peace of mind. Simply type in the camera's IP address into the web browser and you'll have streaming access to whatever is going on at home or in the office - all you need is an internet connection! What better way to ensure that everything is running smoothly when you're sick at home or on the road. The high powered security camera also comes with an amazing selection of configurable alarm setting including video lost, video motion alarm, sensor input, sensor output, alarm linkage, alarm automatic connection, and alarm log. You can even take a picture when the alarm goes off and automatically upload it to an FTP server or email it to yourself/others for instant alerts. Buy one of these high quality security cameras now to keep track of your place from anywhere in the world. A very low China wholesale price along with Chinavasion's famous 12-month warranty should make this great deal an easy choice as your next security camera. Get yours today along with many other amazing electronic gadgets from Chinavasion today! Sony Super HAD CCD for the best IP Camera image you have ever seen! Camera is weatherproof and designed to work under wet and snow conditions. Built-in alarm system, can be configured to send alarm signal via external method such as alarm system, FTP, Email, etc. Both I45 and I44 will work under the same software system. So you can mix and match your selection of cameras and control all of them with single software system. I44 has a slightly longer viewing range. For even more alarm options, you can connect additional alarm devices such as an alarm host or access control system via the COM port. To help transfer images with good speed and quality, captured video is compress in H.264/MPEG4 standard to save bandwidth and minimize lose of detail. Support LOGO display and video mask. LOGO and video mask position can be displayed on any place in image. Can I buy several of this camera and have them installed in the same network? Yes, you can. You can also mix and match the I44 with I45 to setup on the same network and controlled by a single software system. Does this unit come with audio? It comes with audio support, meaning it'll work, but you will need a separate audio recording system first. Can you really use this from across the world? That's right, simply copy in the camera's IP address to an Internet Explorer address bar for instant viewing. 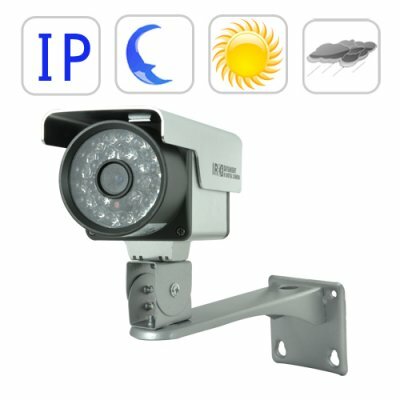 How do I setup my IP camera? The illustrated user manual provides you with everything you need to know, from initial setup to COM settings. This IP Camera seems a bit hard to set up.. Can you help me? Throw any questions at our customer support, but be warned: This product is designed to be used by experienced surveillance camera users. If you need a beginners model IP camera, we suggest you order model CVLM-I33.